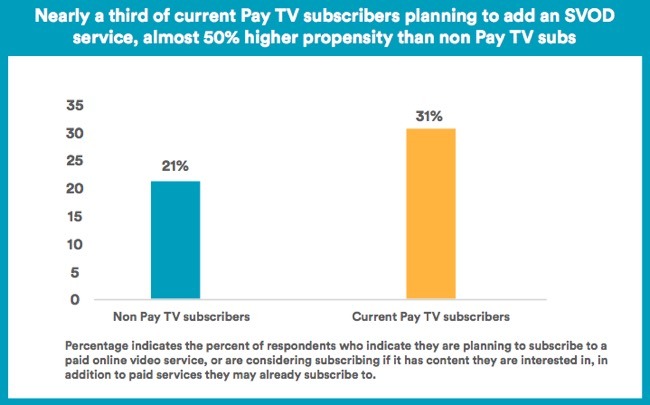 New research from Interactive Broadband Consulting Group (IBB) suggests that pay-TV subscribers may actually be more fertile targets for adding SVOD services than non-pay-TV subscribers. IBB found that 31% of current pay-TV subscribers plan to add an SVOD service over the next 6 months, vs. 21% for non-pay-TV subscribers. The data supports the theory that heavier TV watchers seek more great TV to watch (and therefore are more prone to subscribe to SVOD services which are offering a ton of originals) than lighter watchers. That’s not to say there isn’t also a segment of what I’ve called “entertainment-only’s” who will resist paying for the multichannel bundle which is anchored by expensive sports networks. IBB also found that 45% of all respondents are willing to spend more on video services, with 80% saying they’d spend up to $20/month and 20% saying they’d spend more than $20/month. Another interesting data point from IBB is that 72% of respondents want some type of bundled service, whether pay-TV alone or with SVOD. The IBB data suggests that an interesting value proposition for pay-TV operators to pursue would be seamless bundling of key SVOD services. This would include one touch access to SVOD within hybrid set-top boxes (e.g. Comcast’s X1) and unified search. I’ve proposed this in the past a number of times (here and here). Certain U.S. operators are pursuing this path, as are international operators like Bell Media in Canada and Virgin and Com Hem in Europe. Yet another reason to blend pay-TV and SVOD into one set-top experience is that IBB found 25% of respondents intend to buy a new streaming media device in the next 6 months. These inexpensive devices have become extremely popular in the past few years, but they do require consumers to switch inputs on their TVs, causing inconvenience. Pay-TV operators offering an all-in-one set-top could eliminate this step and create more convenience. Stepping back, IBB’s research also substantiated online video’s massive appeal. 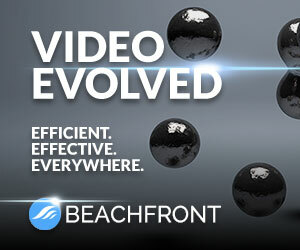 IBB found that nearly 9 in 10 respondents use at least one free or paid video service. 80% use 1-5 video apps per week, 13% use 6-10 and 7% of “super-streamers” use over 11. Nearly 75% of respondents also said they binge-view. No surprise, the heaviest bingers are 18-29 years-old, with over 50% watching 1-2 shows/week, 22% watching 2-5, and 14% watching more than 5. The full research report is available as a complimentary download here.